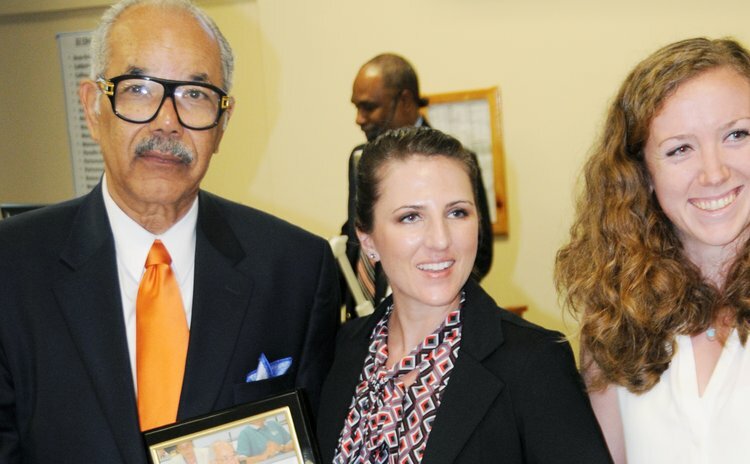 One of Dominica's most respected medical doctors has been recognized by the Ross University School of Medicine for his sterling contribution to that institution. Dr. Gerald Grell, MBBS, MD, FACP, MB. BS (Lond - UCWI), MD (Lond), FACP, FRCP, DTM&H, JP, SAH, FRCP - Dean for Clinical, Academic & Community Affairs of the Ross University School of Medicine, took another award to add to his already big collection. The plaque was presented to him at the 50th research day symposium on The Heart of Medicine, which was held at Classroom 4 at Ross University in Portsmouth on Friday. "It is fitting that we pause to recognize the outstanding contribution of one of our faculty members to the growth of medical education, the improvement, establishment of this specific forum, and ultimately his contribution and this impact of this contribution, on the lives of students and ultimately the communities which would serve through them," said Chairperson and Associate Professor of Behavioural Science and AICM Department, Dr. Paul Ricketts. Dr. William Lynn Weaver, Senior Associate Dean also stated that he has only been in that position for six months but, "I have become in awe of Dr. Gerald Grell, and the things that he has done for this school and this country, and he is a Dominican by birth, a Dominican to the core of his heart." On another note, Dr. Paul Ricketts Associate Professor Behavioural Science and AICM Department, is calling for information systems for health. He said: "Given the limited resources, we have to target our resources to those people who need it most, identify those high risk population, identify those interventions that work, harnessing the patient centre medical records and also importantly changing the paradigm. We must stop talking about health information systems and now begin talking about information systems for health which interfaces health care with all of those determinants. "Ministries of Agriculture, Trade, Police, Road Safety all of these things need to be integrated into one system that will inform, how we spend our health dollars." He argued that we have to stop focusing on treatment and start looking at determinants and prevention. He said: "we need to ensure that the students who are going out there today, can see primary care and prevention as a viable way forward, given the huge investments that they make in their medical education." Also addressing the symposium was Dr. Dale Abel, Professor of Medicine and Bio Chemistry, Division Chief, Diabetes Centre, Director University of Iowa. He said that there is an outburst of Type II diabetes globally. "This is the epidemic of the 21st century, and therefore it really raises the importance for the need for innovation and research, and I think as a consequence, this is going to lead to a tremendous burden of diseases leading from diabetes complications," he said. "Clearly reducing diabetes complications is an important imperative, preventing Type II diabetes or delaying its onset, is clearly and important imperative." Dr Abel also mentioned that it is important to keep in close contact with patients and suggested text messaging, a technique that is being used in the US.